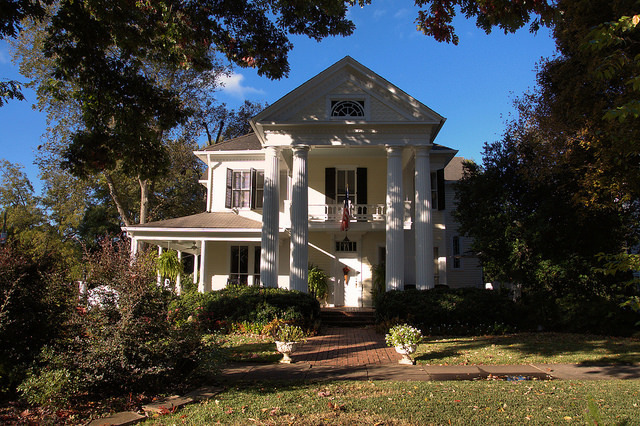 Built for Judge Rufus Roberts by architect E. J. Alling, this is now The Antebellum Inn, a bed and breakast and event space. Mary Moore Jones recently wrote that Edward Thomas Alling built this house, as well as many others throughout central Georgia. E. T. Alling was the great-grandfather of Mrs. Jones’s late husband, Aubrey Alling Jones. She noted: The Roberts /Hines family lived in the house for a few years then it was bought by the Myricks then in 1914 purchased by my husband’s grandfather Lodrick M. Jones for his own retirement, the house his father in law had built. Unfortunately he died in 1922 before he retired and the house passed to his wife, Isabella Alling Jones, then to his daughter Elizabeth Myrick Jones then to my husband Aubrey Jones. From 1914 until the mid 1990’s it was known as the Roberts/Myrick/Jones home.